She Couldn’t Believe It When She Saw What You Believed! There’s been a lot of back on forth lately (mostly forth) about some really outrageous things in the news. You may have been tempted by the delicious aroma of moral superiority. You may have even taken a bite. I’m sure it tasted oh-so-good, but I have a question for you. Do you even know where your outrage was manufactured? 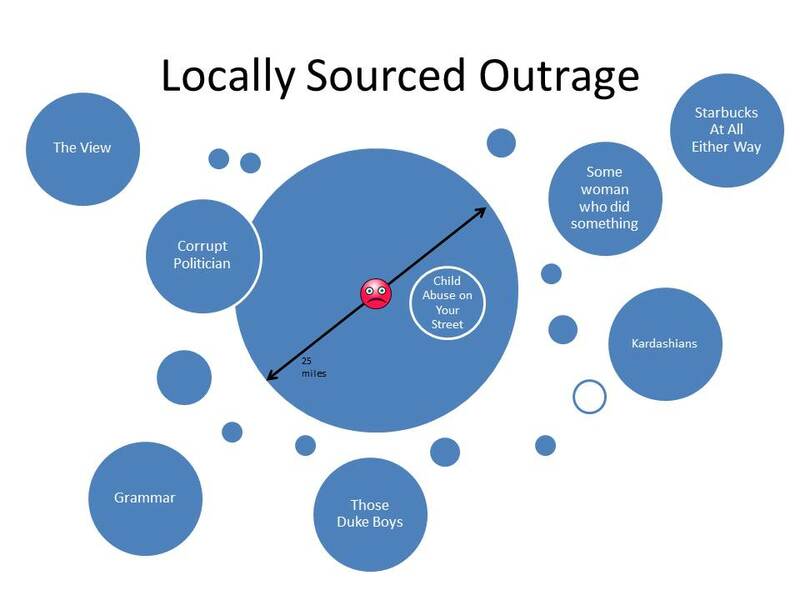 Most people assume that because they are personally having the outrage, it’s locally sourced. But how do you know your outrage is wholesome organic outrage, not some pre-packaged, processed frankenfit? For all you know, Big Aggro is importing your outrage from an overseas factory server farm! They aren’t even required to label it! Be outraged about things within a 25 mile radius of yourself. Support local outrage, and know that your outrage is genuine, organic outrage grown right in your backyard. This entry was posted in Manifestos, Other Stuff and tagged Cynicism, Humor, Locally sourced, Outrage, Satire, Social media, tragic coffee issues. Bookmark the permalink.